Product Name: Sabudana Buy Sabudana Online from The Spice Market, Whole Sale Price at Online Retail Shop We Ship All Over India. Other Names are Tapioca Sago, Javvarisi, Shagu. Tapioca Sago - Sabudana is used in a variety of dishes such as desserts boiled with sweetened milk on occasion of religious fasts. In India, Tapioca Sago -Sabudana is considered an acceptable form of nutrition during periods of fasts for religious purposes or for infants or ill persons. 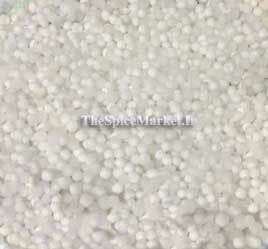 Sabudana is processed food product which is manufactured from the starch extract of the tapioca root. Globally it is known as Cassava. Sabudana is nutrition rich products, it is extremely perishable because of its high starch and moisture content. Sabudana is fully loaded with carbohydrates, iron, folic acid, Vitamin B and calcium. South America Amazonian is the origin of sabudana. In India we use sabudana in preference of or in addition to rice/potato/maize. Sabudana is main used in India, Brazil, Africa. It is consider to a best non cereal food. Sabudana Helps in muscle growth. Sabudana Helps to control blood pressure. Sabudana prevents from birth defects. Sabudana Works as a energy booster. Sabudana Helps to gain weight. Sabudana is a common feature in Indian cuisines, at the times of Navratri many dishes are prepared with it.Sabudana will be soaked to before it is used in kheer, Vada, khicidis, The tiny globle like shape and its texture gives a chewy flavor. It is mainly used in falooda, jigarthanda, payasam, Badam gheers etc.